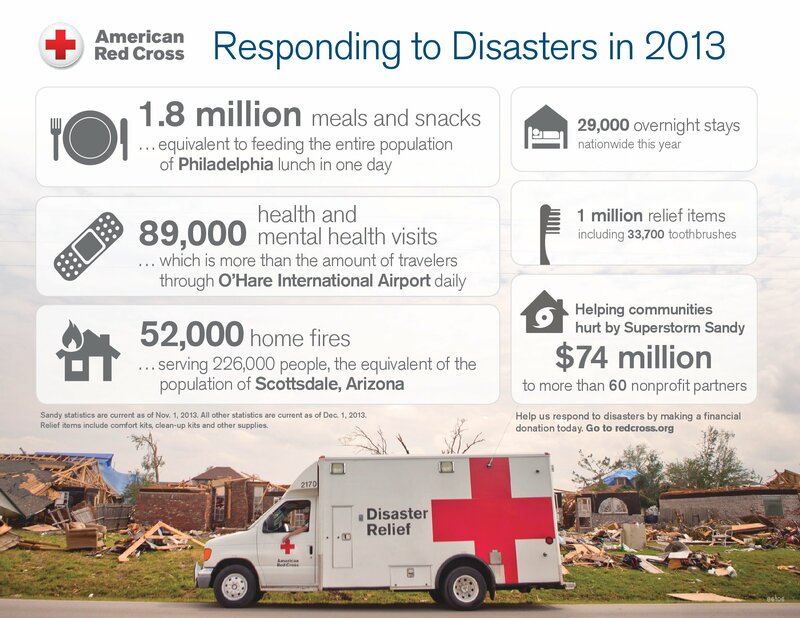 For more on this year’s disasters, view the end-of-year infographic and video. During this holiday season, the American Red Cross is grateful for the support of our corporate partners that generously contribute to our Holiday Giving Campaign. They include: Circle K and its customers in the West and Florida divisions, Community Safety Foundation, funded by CSAA Insurance Group, a AAA Insurer, Mazda and its Dealers nationwide and University of Phoenix. Thanks to the generosity of these and other sponsors, the Red Cross is able to carry out its mission of helping people prevent, prepare for and respond to emergencies everyday here and around the world. Each holiday season the Red Cross gives everyone the chance to support our work by giving blood, signing a card for military heroes or buying a gift through our holiday catalog. To support the Red Cross this Holiday Season, visit redcross.org/holiday. The American Red Cross recently launched the Team Red Cross App, which allows people to sign up to help, get an overview on basic tasks and receive notifications about Red Cross disaster volunteer opportunities in their community. Often when a disaster strikes, people in the community want to help but may not know how. 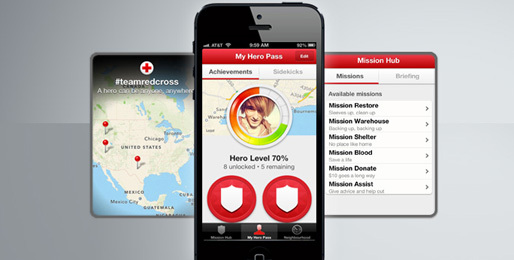 The Team Red Cross App puts the power to help in people’s hands. First, people create an account. Then they learn about different jobs, such as working in a warehouse, handing out supplies or assisting with feeding. 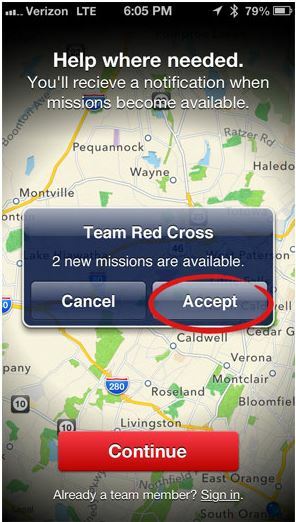 When the Red Cross has a need for volunteers, users will receive a notification based on their location. People can instantly accept or decline the volunteer opportunity. Through lists of simple steps, short videos and quizzes, you will receive a quick orientation—right on your phone—before you show up for a Red Cross volunteer job. Ability for people to share notifications for volunteers with their social network. Earn digital “badges” by completing a job test, accepting a job, sharing the app, recruiting volunteers, etc. The “badges” can then be shared with their social network. Allows people to donate money to the Red Cross and sign up to donate blood. Offers emergency response information that people can share with their friends at the touch of a button. The Team Red Cross App is the seventh in a series of highly successful Red Cross apps, which are now on more than 3 million mobile devices across the country. More than 400,000 people downloaded the Hurricane App during Superstorm Sandy. Right before and during Sandy, users spent the most time reading the preparedness information, tracking the storm, and reading and then sharing NOAA alerts through social media. You don’t have to be an experienced volunteer to download the app. Even if you are new, there are job overviews, short videos and quizzes you can use to get a better understanding of what Team Red Cross does. Team Red Cross is looking for people with different backgrounds, talent, and skill levels. The Team Red Cross App can be found in the Apple App Store and the Google Play Store by searching for American Red Cross or by going to redcross.org/mobileapps. American Red Cross chapters serving all of Wisconsin, plus the Michigan border communities are just days away from the Wisconsin Disaster Training Conference to be held at the Gruenhagen Conference Center on the University of Wisconsin-Oshkosh Campus from October 18-21, 2012. More than 200 have registered for entry-level to high-level training with courses taught-by, and open-to, community partners as well as newcomers and long-time Red Cross responders. Specific training tracks are scheduled so a person can grow within their chosen line of service. Training tracks include: health services, mental health, sheltering, operations management, feeding and disaster communications. Therefore, a person with professional skills, such as a licensed mental health professional, can learn the Red Cross guidance to make their disaster deployment the most beneficial for the people we serve. In other capacities, we are looking for volunteers with a strong will to help others, are compassionate and are ready for training. All courses will have a strong emphasis on collaborative efforts before, during and after disasters. For instance, fostering working relationships with other first responders, community leaders and mutual aid assets are vital to a successful response. While we have the trained team to establish a shelter, we need the location, which is where our community partners and advanced planning comes into play. All courses are free to disaster responders, just like the services we provide during times of need. In fact, the Red Cross responds to more than 70,000 disasters a year – more than 1,100 in Wisconsin last year. Course participants will be asked to respond to local disasters first and then as skills and availability rise, they maybe deployed to larger or national assignments. For example, during Hurricane Isaac, several Emergency Response Vehicles from Wisconsin were driven to the Gulf Coast. During the ERV Ready, Set, Roll course, we will certify additional drivers. Due to over-whelming registrations for the International Humanitarian Law course, we’ve added a class on Wednesday, October 17th. This class explores guiding principles from the Geneva Conventions which sets forth Red Cross involvement around the globe. For the complete list of classes please visit redcross.org/newisconsin or redcross.org/sewisconsin. The American Red Cross shelters, feeds and provides emotional support to victims of disasters; supplies about 40% of the nation’s blood; teaches lifesaving skills; provides international humanitarian aid; and supports military members and their families. The Red Cross is a charitable organization which depends on volunteers and the generosity of the American public to perform its mission. For more information, please visit www.redcross.org or join our blog at http://blog.redcross.org. Editorial note: Call (202) 303-5551 to speak with an American Red Cross spokesperson on the ground. Visit the Red Cross Disaster Online Newsroom for response information, including photos, audio, and press releases. 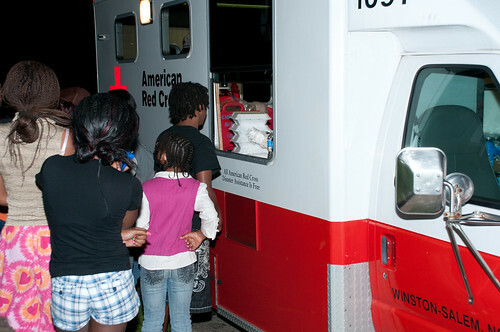 Residents wait to receive meals from an Emergency Response Vehicle in Raleigh, NC. WASHINGTON, April 18, 2011 – The American Red Cross is working around the clock to provide relief to people affected by the deadly tornadoes and scorching wildfires that left a path of destruction in six states across the south over the weekend. Strong tornadoes ripped homes off their foundations, destroyed businesses and schools, overturned cars and buses, uprooted trees and downed power lines in Oklahoma, Virginia, North Carolina, Alabama, Arkansas and Mississippi. In North Carolina alone, preliminary disaster assessments show almost 500 homes destroyed and more than 1,000 damaged. Some of the hardest hit areas are still inaccessible, and officials say that many more than 1,000 families will be homeless in the state. Red Cross workers sheltered more than 500 people over the weekend, served meals throughout the affected neighborhoods, and provided personal hygiene items and supplies to help as the clean-up begins. With government officials reporting more than 40 deaths from the tornadoes, Red Cross disaster mental health workers are available to help people cope with the aftermath. Red Cross chapters throughout the south are deploying trained disaster teams into the area and more than 25 Red Cross emergency response vehicles are in hard-hitNorth Carolina, or on their way to the state. In Texas, wildfires have spread across more than 700,000 acres, destroying homes and forcing people to leave their neighborhoods. Red Cross disaster workers have opened shelters and are feeding those displaced by the fires. As families return to their neighborhoods, Red Cross teams are providing them with food and water. The Red Cross is also assisting those who have lost their homes to the fires, providing them with food, clothing and other necessities. Since the end of March, the Red Cross has offered relief to people affected by 35 disasters in 20 states. 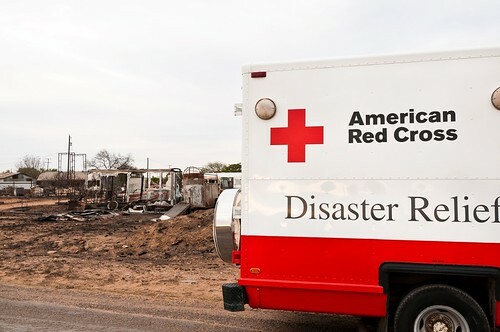 The Red Cross is able to respond quickly with the help of corporations who are members of the organization’s Annual Disaster Giving Program (ADGP). ADGP members pledge donations on an ongoing basis to allow the Red Cross to pre-position supplies and be ready to take immediate action when disasters occur. ADGP members include 3M, Altria, Aon, Cisco Foundation, ConAgra Foods, Darden Restaurants, Inc., Dr Pepper Snapple Group, FedEx Corporation, GE Foundation, The Home Depot Foundation, John Deere Foundation, Kimberly-Clark Corporation, Kraft Foods, Lowe’s Companies, Inc., Merck, Morgan Stanley, Nationwide Insurance Foundation, Northrop Grumman, Ryder Charitable Foundation, Southwest Airlines, State Farm, State Street Foundation, Target, The TJX Companies, Inc., UnitedHealthcare, UPS and Walmart. The Red Cross depends on financial donations to help people affected by disasters like these tornadoes and wildfires. You can help by making a donation to support American Red Cross Disaster Relief. Visit http://www.redcross.org, call 1-800-RED CROSS or text the word REDCROSS to 90999 to make a $10 donation. Contributions may also be sent to your local American Red Cross chapter or to the American Red Cross,P.O. Box 37243,Washington,DC20013. Fire Crews at the East Mason Street Fire on January 6, 2011. Nine people displaced, and Red Cross assisted eight. The American Red Cross Lakeland Chapter responded to a house fire in Wrightstown around 6:30pm on Saturday, January 8, displacing six people. Two Red Cross volunteers were on the scene to assist the three adults, two teens, and one child with their immediate emergency needs. We provided hotel stay and monetary assistance for clothing and food. We also provided comfort kits (which include soap, shampoo, toothbrush, toothpaste, washcloth, comb, facial tissue, deodorant, razors, shaving cream and lotion) and homemade quilts to all family members. This morning around 6:30am we received another call of a house fire on Doty St on the East side of Green Bay affecting 9 adults. Two Red Cross volunteers assisted 8 adults with monetary assistance for clothing and food. All clients also received comfort kits and homemade quilts. They all had friends or relatives to stay with. One individual did not utilize Red Cross services. We need your help! Red Cross disaster assistance is free and is made possible by community donations. You can help individuals of this disaster and others by making a financial gift to the American Red Cross Lakeland Chapter for local disaster relief. For information call the Lakeland Chapter at 920-468-8535 or visit www.arclakeland.org. But disaster strikes every day in the United States. Not just once, either—the American Red Cross responds to about 200 disasters every day, amounting to some 70,000 in a year. Every Single Donation Brings Hope!